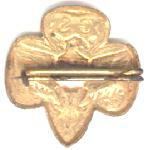 A quick reference page of many Girl Scout pins. Scroll to the bottom of the page for some detailed dating information for the earliest Membership pins, researched by Cal Holden and shown here with his permission. Since Girl Scout leaders (Captains) earned badges and wore the same uniform (with badges and ranks sewn on just like the girls) something had to be done to identify the leaders. Special hat and shoulder cords were worn, and around 1916 the Capitan's Pin was introduced. 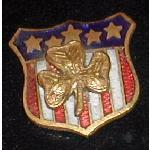 The gold 3-leaf clover sits atop a red, white and blue shield. In 1917 a Lieutenant's Pin was introduced, to be worn until the adult passed the First Class Rank - when it was switched to the Capitan's Pin. 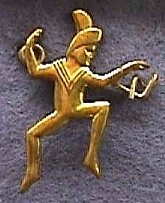 The Lieutenant's Pin was discontinued in 1922. 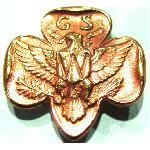 Check out the War Service and Special Awards page for more detailed information on these pins. 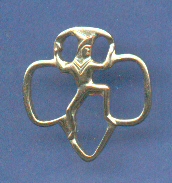 The Traditional Logo Girl Scout pin was once called the Tenderfoot Pin. 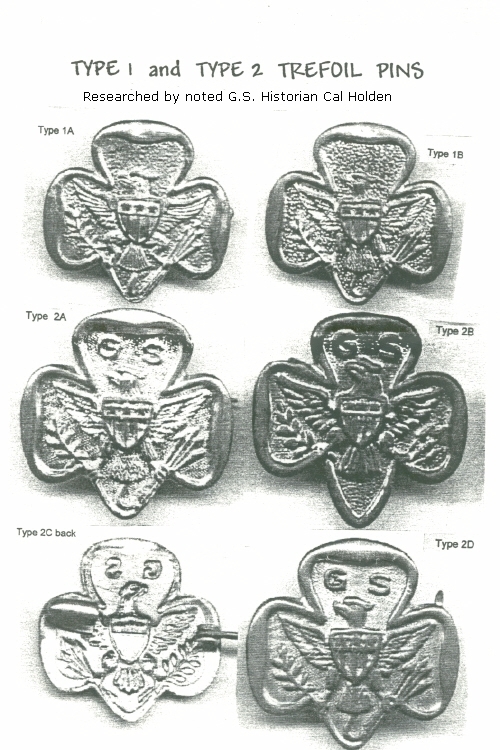 The symbolic design of the pin, according to The Girl Scout Collector's Guide, is as follows:"the eagle is a symbol of strength and victory and the shield on the eagle's breast signifies self-reliance. In his talons, he clutches on his right an oliver branch, the symbol of peace and on his left a shaft of arrows, the symbol of might. The eagle faces right, which is the position of honor, looking toward the symbol of peace. 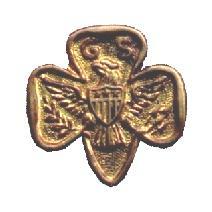 The eagle and shield within the trefoil signify that Girl Scouts stand ready to serve their country." 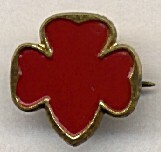 The shape of the pin, a trefoil, indicates the threefold promise. 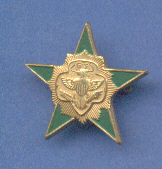 3 Stars on Shield - No "GS"
The 7 Star pin in the standard size is rare, due to the short time it was offered. However, the miniature version was offered for a long time and is not rare. Mariner Girl Scout information page. 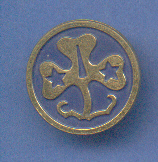 Membership Petals were used by Brownies, just as the green disc and star pin are used today - to signify membership in the organization. 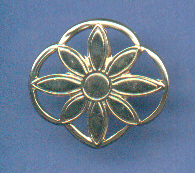 Brownies first had a bronze star, but swtiched to the five petal flower pendant in 1939. 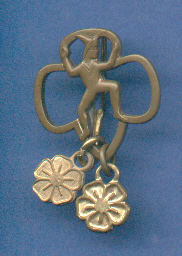 They switched to the star pin in 1956. 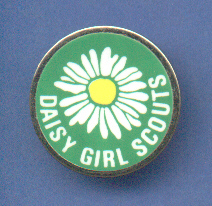 The Daisy Girl Scout program officially began in 1984 after many years of studying pilot programs in several councils. Designed especially for 5 years old girls in kintergarden, it is now expanded to include 6 years old girls. Enameled design on goldtone metal. Membership stars are given to Girl Scouts to denote one year of membership. Plastic colored discs are different for each age level. The 2000 disc is plastic as well. A special Adult 2000 pin was produced as well - shown on the Flags and Friendship Pins page. 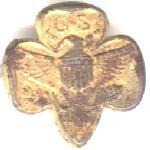 Type 2 = Trefoil shape with an eagle and the letters GS, but no ribbon in the eagle's mouth. About 1917-1922. 4. from 3 to 5 tail feathers. They show a definite feather texture. Type 2A. 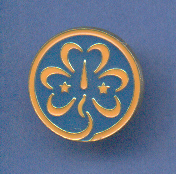 When the decision was made to update the design by adding the letters GS, the order was probably given to the same company which made Type 1 pins. Accordingly, Type 2A has all the characteristics of type 1B plus the letters "GS". Type 2B. Wartime shortages during WW I would have cut off the supply of brass and it may be supposed that the first company might have run out of brass. Furthermore, suppose that another badge company had a stock of brass available, so they were given a contract to make the pins. But they had to make their own dies. This would explain the changes in design such as 4 bars in the shield and no cord connecting the tail to the arrows. No doubt this would have been a rush order to fill in for the first company. So it is not a surprise that the pins in group 2B are rather crude. The wing feathers are crude, the tail feathers are crude, and the eagle's head is crude. Type 2C. In order to conserve the dwindling supply of brass the second company is likely to have revised the back die to indent the back in a reverse pattern so as to make the pin thinner and save metal. Also the neck of the eagle and the arrangement of the arrows were improved to make type 2C. The overall design was still crude. Some of the above is supposition, but it is clear that the Type 2C pins with 4 bars and no cord to the arrows is the only type with the wartime feature on the back. So, Types 2B and 2C must have been made in 1917-1918. This means they are some of the earliest Type 2 TF pins. Type 2D. Again, suppose that the first company had an unfinished contract and also made a better product, so they resumed production when brass was again available. 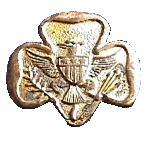 Type 2D goes back to 3 stars, 3 bars and a cord from the eagle's tail to the arrows. The difference between the 2A which is from before the brass shortage and 2D from after the war is that 2A has a heavily textured background like Types 1A and IB. Type 2D, however, has a matte textured background that is hardly noticeable. 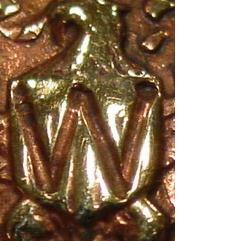 The pin shown as an example of2D has an engraved date on the back of 6/8/21 so its heritage is clearly shown. 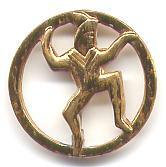 Conclusion: it is suggested that the WW I wartime brass shortage forced a change of supplier for the TF pins. That explains why some Type 2 TF pins have 4 bars in the shield and no cord to the arrows. And that means these pins are older and less common than most of the Type 2 pins with 3 bars in the shield.